Reduce, reuse, recycle. Words to live by. While I love to recycle, reduce is my favorite. If we have to use products, at least choose ones that can easily be recycled. In October, I was given a chance to tour a recycling facility to get more details about the recycling programs in Central Virginia for my Richmond Times-Dispatch column, Why, Richmond, Why?!? 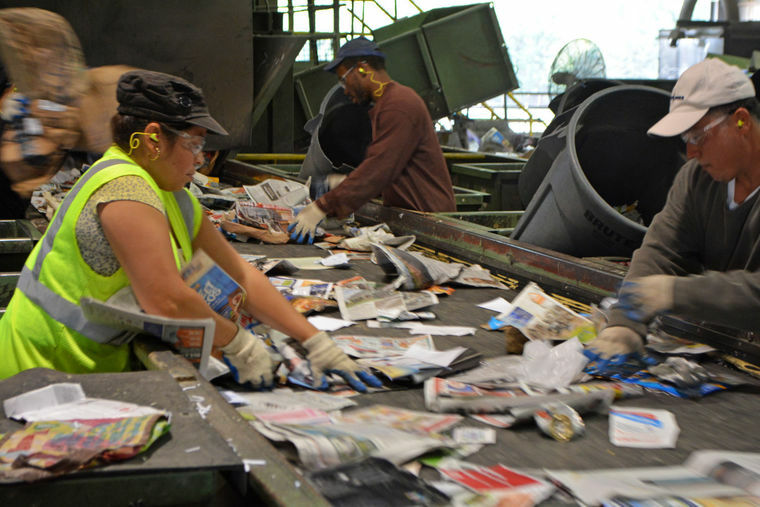 Readers have continued to express to me their doubts that recycling programs work and that the effort to gather and sort materials is worth the time. I was challenged to “get out from behind your desk and do a little investigative reporting” by a reader. Glad to oblige, it doesn’t take much to convince me to get up from my desk. Nonrecyclable items often find their way to the facility. TFC Recycling doesn’t want foam products, food-contaminated items, juice boxes, milk cartons or any plastic caps and lids. Other unwanted items are plastics (other than those marked 1 and 2) and plastic bags, which can easily get stuck in the sorting machinery. I was sad to discover that dirty recyclable materials are sometimes deemed garbage too. I’m guilty of trying to recycle bottles and cans I recover from the James River. They need to be washed before recycling if they are muddy. Same for containers covered in food residue. I’m guilty of tossing items in to the recycling bin without being sure they are acceptable, despite all of the information shared by CVWMA. Especially pieces of metal, random boxes and glass objects. I was glad to find out that a broken bottle can be recycled in Richmond — as long as it is clean. But next time I might not toss in a random piece of scrap metal I find on the side of the road. I was amazed to see how fast the workers performed their sorting tasks at TFC. I channeled my inner Mike Rowe from Discovery Channel’s “Dirty Jobs” and thought about how geeked out I would be if I worked at the TFC Recycling facility for a day. It was a well-run, smooth operation. And it was unexpectedly clean. See the photos from TFC’s Chester plant. My personal recycling habits will change a little as a result. I will need to clean a few containers a little better, lest they get rejected. I may stop buying cartons for juice and milk, sticking with plastics. Glass would be an even better recycling choice, however we would take on the added the breakable risk in the kitchen (you know, children). Again, the best decision should be to consume less, which creates less waste. To be conservative. That is the true application of the word — not the modern usage stolen by political parties. Recycling requires a lot of work. Consumers may have to wash, sort and transport recyclable material to a collection point. Even if people are fortunate enough to have a curbside service that picks up any and all recyclable material, the work doesn’t stop there. The recycling center also has a lot of work to do. It may have to clean and separate materials. It may not be equipped to recycle all types of material. It takes time, energy and money to make recycling work. So are some things better off in landfills? That depends upon how you look at the problem — not all recycling centers are equal and the environmental issues are complex. How much energy was needed to collect and break down the material? How much energy was needed to change that material into something new? How much energy was needed to transport the new materials to their ultimate destination? And is that amount of energy less than it would have taken to fashion products out of virgin materials? If not, then you may be causing more environmental harm by recycling something than by just tossing it in the garbage. Or consider glass. Ground-up glass is essentially sand, which isn’t harmful to the environment. Collecting, transporting and recycling glass can consume more energy than producing new glass containers. Reusing glass containers rather than throwing them out is an even better idea.